Mixology: The Buffalo Gold Cocktail. Brookville Restaurant, Charlottesville, Virginia. Virginia Pippin Gold Cider (with Virginia apple brandy) Meet Kentucky’s Buffalo Trace Bourbon. The Cocktail: The Buffalo Gold. The Venue: Brookville Restaurant, Charlottesville, Virginia. The Cider: Foggy Ridge Cider Pippin Gold. Pippin Gold is a unique blend of 100% Newtown Pippin hard cider and apple brandy from Laird and Company, the country’s oldest distiller. Pippin Gold is delicious as a dessert cider or sweet apéritif. Some have swooned over peaches soaked in Pippin Gold served with homemade pound cake. Image: Malus domestica: Yellow Newtown. Charlottesville, Virginia, 1904. Plans are afoot for The Wassail. Honoring The Orchard & Celebrating The Apple. Trees with snow on branches, “Half Dome, Apple Orchard, Yosemite,” California. April 1933. Photographer: Ansel Adams, 1902-1984. Cider is one of the good gifts which are to be received with thanksgiving. We therefore believe that cider is one of the good gifts which are to be received with thanksgiving; and we desire to see its manufacture so perfected, that it will rank with wine in public estimation: and if our experience can add to the stock of information on this subject, we cheerfully give it, though we may encounter the reprobation of some ultra abstinence, not to say, temperance men. From: Tilton’s Journal of Horticulture, Volume 5, J. E. Tilton & Company, 1869. To read more about Cider and Cider-Manufacture, see Tilton’s Journal of Horticulture, Volume 5. Image credit: October. Leslie Bryan Burroughs. . Library of Congress Prints and Photographs Division, WPA Poster Collection, Reproduction Number: LC-USZC4-7683. November. Ben Kaplan. . Library of Congress Prints and Photographs Division, WPA Poster Collection, Reproduction Number: LC-USZC4-7684. Celebrate the New York Cider Revival and Win Your Own Cider Library! It’s The 3rd Annual Cider Revival at the New Amsterdam Market in New York City Sunday, November 24. Enter to win an amazing Cider Research & Reference Library – several publishers have generously donated some terrific books – perfect for the cider & apple lover or the cider curious. For yourself or for gift giving. The Cider Research & Reference Library includes a few bottles of real New York cider! Stop by the main Market table on Sunday Nov. 24th, and enter to win The Cider Library with Libations! Tickets $5 each or $10 for 3. Such value! and for a good cause. All proceeds to benefit The New Amsterdam Market. Cider Hard & Sweet: History, Traditions, and Making Your Own 3rd Edition by Ben Watson, The Countryman Press, 2013. Taste, Memory: Forgotten Foods, Lost Flavors, and Why They Matter by David Buchanan, Chelsea Green Publishing, 2012. The New Cider Makers Handbook: A Comprehensive Guide for Craft Producers by Claude Jolicoeur, Chelsea Green Publishing, 2013. The Drunken Botanist by Amy Stewart, Algonquin Books, 2013. Worlds Best Ciders by Pete Brown & Bill Bradshaw, Sterling Epicure, 2013. True Brews: How to Craft Fermented Cider, Beer, Wine, Sake, Soda, Mead, Kefir, and Kombucha at Home by Emma Christensen, 10 Speed Press, 2013. Johnny Appleseed And The American Orchard: A Cultural History by William Kerrigan, Johns Hopkins University Press, 2012. Apple Lovers Cookbook by Amy Traverso, W. W. Norton & Company, 2011. Cider Handbook from Scott Labs, 2013. Stop by the New Amsterdam Market this Sunday, November 24th, to celebrate the New York Cider Revival, enter to win this swell cider library, and get your holiday marketing done. Includes Makers of Cider, Perry, Fruit Wines, Meads, and Ice Ciders. Last updated November 24, 2013. Please visit the individual cider makers websites to see what events they have scheduled throughout the year. Virginia Tech Virginia Agricultural Experiment Station Virginia Tech – click this LINK to explore various cider and apple related materials including downloadable pdfs. Apples of North America: 192 Exceptional Varieties for Gardeners, Growers, and Cooks by Tom Burford, Timber Press 2013. Old Southern Apples. A Comprehensive History and Description of Varieties for Collectors, Growers, and Fruit Enthusiasts by Creighton Lee Calhoun, Jr., Chelsea Green 2011. 3 Apples of North America: 192 Exceptional Varieties for Gardeners, Growers, and Cooks by Tom Burford, Timber Press 2013. 4 Old Southern Apples. A Comprehensive History and Description of Varieties for Collectors, Growers, and Fruit Enthusiasts by Creighton Lee Calhoun, Jr., Chelsea Green 2011. Visit CiderGuide.com to view current US Cider Map and to see if Virginia has any new cider makers. Please leave a comment if you have VIRGINIA cider resources to add. The State of Cider: New York and Virginia. As One Cider Week Concludes, Another Commences. Cider Week New York. With this years numerous pre and post events, Cider Week NY has become an extended cider-filled celebration, exuberantly launching New Amsterdam, and environs, into the colder seasons of pome fruit drinking enjoyment. As New York cider festivities – though not New York’s cider enthusiasm – wind down, Virginia prepares for Cider Week Virginia. American wine has a long history in Virginia, as does American cider. Virginia’s cidermakers have done much to restore our favorite fermented apple elixirs place at the table, and Cider Week Virginia celebrates the regions cider heritage and revival. Our September Cider Road Trip to Virginia was chock full o’ cider. Upcoming posts will feature highlights of our Blue Ridge & Balto. cider adventures, and details of favorite Cider Week NY activities. Save The Date for the final Cider Week New York event, November 24th, 2013. The New Amsterdam Market, in collaboration with Glynwood, will host The Third Annual New York State Cider Revival at The New York State Cider & Thanksgiving Market. Visit newamsterdammarket.com for more details. Cider Week Virginia ciderweekva.com November 15-24, 2013. New Amsterdam Market newamsterdammarket.com November 24th, 2013. Resources: Your Daily Cider @HelloCider! Your Daily Cider: Tweeting Cider News from around the world, with a focus on Cider in the USA (and North America). With @HelloCider we attempt to cover all things Cider: Cidermakers Profiles, Emerging Makers, Cider Debuts, Orcharding, Pollinators, Cider (Pome) Fruit Stories, Cider Business & Legislation, Cider Events, Cider History & Lore, Cider-Serving Establishments, Cider Reviews & Tasting Notes, Cider Recipes & Pairing, Cider Mixology, Cider Organizations, Heroes of Cider and Cider Readings & Resources. Everything Useful, Pertinent or Of Interest Re: Cider. Tweeting Daily Cider Since December 2013. The State of Cider: Massachusetts Prepares to Celebrate CiderDays. 19th Annual Franklin County CiderDays will be held this weekend, November 2-3, 2013. CiderDays is one of the premier events of the North American Cider Season. Two days celebrating and enjoying The Apple. • Second Annual Cider Days Harvest Party 2013 Friday, Nov 1st – A kickoff event to benefit CiderDays & includes the début of West County Ciders releases for 2013. • The Cider Salon — “the world’s largest hard cider tasting with more than 60 individual cider brands from across North America”. • North vs. South Heritage Apple Smackdown, Part Deux, a tasting and discussion with Tom Burford and John Bunker. Visit Franklin County CiderDays website for ALL the details and a complete list of events. Observations on Cider. No. 265. 1867. From the great diversity of soil and climate in the United States of America, and the almost endless variety of its apples, it follows that much diversity of taste and flavour will necessarily be found in the cider that is made from them. To make good cider, the following general, but important, rules should be attended to. They demand a little more trouble than the ordinary mode of collecting and mashing apples of all sorts, rotten and sound, sweet and sour, dirty and clean, from the tree and the soil, and the rest of the slovenly process usually employed ; but in return they produce you a wholesome, high-flavoured, sound, and palatable liquor, that always commands an adequate price, instead of a solution of “villanous compounds,” in a poisonous and acid wash, that no man in his senses will drink. The finest cider was made of an equal portion of ripe, sound pippin and crab apples, pared, cored, and pressed, etc., with the utmost nicety. It was equal in flavour to any champagne that ever was made. Title: Six hundred receipts, worth their weight in gold : including receipts for cooking, making preserves, perfumery, cordials, ice creams, inks, paints, dyes of all kinds, cider, vinegar, wines, spirits, whiskey, brandy, gin, etc., and how to make imitations of all kinds of liquors : together with valuable gauging tables : the collections, testing, and improvements on the receipts extending over a period of thirty years. partake of the cider activities occurring across the country. And take a friend. Cider Week NY & Hudson Valley is well underway and the New Amsterdam region is awash in cider. Great Maine Apple Day an apple-filled day of talks, walks and apple ID sessions with John Bunker and book signings with Claude Jolicoeur. Franklin County Cider Days is in its 19th year as a “community event celebrating all things apple.” Offerings include workshops, tastings, cider salons, and more. Virginia is Cider County. We enjoyed Virginia cider and hospitality on a recent visit, and you can too. Visit the website, pages, and twitter feeds of your favorite local & regional cider makers to find out what events they are involved in. Check your regional cider association, alliance, or organization’s events list. Perhaps it is time for a National Cider Calendar? Saving Apples by Making Cider. Drink a Gravenstein Today. Pomme Fruit: Gravenstein Apples In The Russian River Valley, Sonoma County, California. The Sebastopol Gravenstein, a vividly colored, aromatic, flavorful heirloom apple is historically important in the Russian River Valley. So dominant in the region, the ribbon of roadway running through the acres of orchards became known as The Gravenstein Highway – honoring the apples prolific presence. Declining prices for processing apples, the increasing popularity of other more ‘commercially viable’ apples, and a booming West Coast wine industry, all led to Gravenstein orchards being ripped out to make way for the extremely lucrative wine grapes that now populate the region. Concerned Sonoma County cider makers are working to revive interest in this heirloom apple by focusing on the Gravenstein’s many desirable cider worthy traits, crafting ‘Gravs’ into unique ciders that celebrate and express the heritage of the apple and the region. 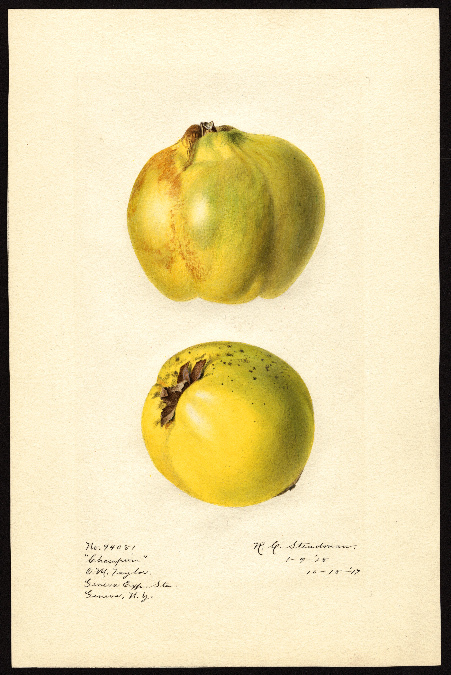 Pomme Fruit: The Harrison Apple. 2 Views: circa 1817 and 1899. Circa 1817 image (left) from the unpublished atlas of Wm. Coxe. Illustration executed by one of Mr. Coxe’s daughters, possibly Elizabeth (Coxe) McMurtrie. 1899 image (right) painted by Deborah Griscom Passmore, an illustrator for the USDA. What We’re Reading: Scott Laboratories 2013 -2014 Cider Handbook. What We’re Reading: The 2013 -2014 Cider Handbook from Scott Laboratories. September 7, 2013 Scott Laboratories announced its first ever Cider Handbook. The 2013-2014 Cider Handbook, is available in the U.S. and Canada. To request a free copy email info@scottlab.com. Or visit www.scottlab.com. The end papers of the handbook features images courtesy of Albemarle CiderWorks, depicting 32 apple varieties including Golden Pearmain, Razor Russet, Black Twig, Crow Egg, and Redfield. When you want to know whose making cider, state by state in the US of A – check Eric West’s new map and list at ciderguide.com. Heirloom Apples. New Amsterdam Market. New Amsterdam Market at the old Fulton Fish Market, on South Street and Peck Slip in Lower Manhattan, this Sunday, September 29th, featured regional cheese makers and dairy products. We could not resist these beautiful apples at the Flying Fox stall. Gravenstein, Pitmaston Pineapple, Hubbardston Nonesuch, diminutive Dolgo Crab, the charmingly named Famuese, to mention only a few, each more lovely than the next. Support your local growers and farmers markets, and encourage fruit diversity by ‘eating it to save it’. Enjoy the seasons beautiful heritage pome fruits. Read more about the vision for the Seaport and the Market District here. Flying Fox, fruit hand-picked and selected by fruiterer, Maggie Nescuir. Apple Belts of North America circa 1914. In comparing the great apple growing regions of the continent it is convenient to designate each by its leading variety. In the eastern part of the continent, there is the Fameuse or Wealthy belt on the north, the Ben Davis belt on the south, and the Baldwin belt lying intermediate between these two. It is seen that varieties differ greatly as to their adaptability to different regions. The degree of soil aeration and of soil moisture and the range of atmospheric and soil temperatures are among the most important determining factors of the geographical range of commercial apple growing with any variety. Passing westward into the mid continental region it is found that the Baldwin belt does not extend west of Lake Michigan. The climatic extremes are here too severe for that variety and many of its eastern associates of a similar degree of hardiness. In all that vast territory which extends westward from the Great Lakes these varieties disappear and do not again appear till the states of the Pacific Coast are reached. Instead the Wealthy belt extends southward till it reaches the region where Wealthy yields leadership to Ben Davis. In this connection it is worthy of note that from the Atlantic Coast westward to the Missouri River, the north margin of the Ben Davis belt approximately coincides with the southern boundary of the geological area covered by the Wisconsin drift. The mid-continental territory in which Wealthy is generally speaking the leading variety includes northern Illinois, the north half of Iowa, and practically all of the apple growing districts of Wisconsin, Minnesota, South Dakota, and northern Nebraska. Among the more important varieties associated with it are for the more northern parts Oldenburg, Okabenal, Patten (Patten Greening) and Malinda. 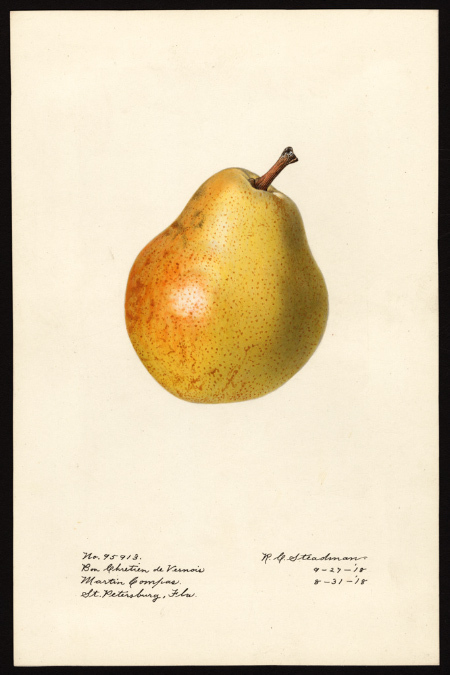 Among the very hardiest of the large size apples for the North are those of the Hibernal group, but their fruit is so austere that it is esteemed of little value except for culinary uses. In the southern part of the Wealthy belt are grown hardy varieties of more or less local value such as Salome, Windsor, Black Annette and Colorado Orange varieties which as yet have not established themselves in the great world markets but which are valued where better varieties cannot be satisfactorily grown. Generally speaking, Ben Davis is the leading variety in central and southern Illinois, the south half of Iowa, and the apple growing districts of Arkansas, Oklahoma, Missouri, Kansas and the south half of Nebraska. With its close kin the Gano, and the Black Ben Davis which evidently are highly colored bud sports of Ben Davis. it probably produces at least one half of the commercial apple crop in this region. Winesap and Jonathan appear to be next in order of importance with Winesap perhaps in the lead. Other important varieties are Grimes, Rome Beauty, Willow (Twig), Missouri (Pippin), Minkler and Ralls. York Imperial is gaining ground Stayman Winesap is one of the newer kinds which will be more largely planted. Delicious also is attracting attention particularly because of its agreeable dessert quality and good appearance. The Stayman and Delicious are being planted to some extent in the southern part of the Wealthy belt as Jonathan and Grimes have been. Read or download a copy via google here. 1 art original : col. ; 16 x 25 cm. Cider Ireland. Then and Now: AppleFest. Slow Food Apple and Craft Cider Festival. Cider used to be made in the south of Ireland, but the industry had almost become extinct until revived by the Department of Agriculture, which in 1904 erected a cider-making plant at Drogheda, Co. Louth, gave assistance to private firms at Dungarvan, Co. Waterford, and Fermoy, Co. Cork, and provided a traveling mill and press to work in the South Riding of Co. Tipperary. The results have been highly satisfactory, a large quantity of good cider having been produced. Cider Ireland is a group of like-minded apple growers and cider makers from the island of Ireland. As a group we can promise you that we are owner operators who only make cider from 100% Irish grown apples, that the cider we produce is made from the juice of pressed apples, never, ever from concentrate, and we don’t add colourants.